Measurement of Capillary Morphology and Capillary blood cell velocity. 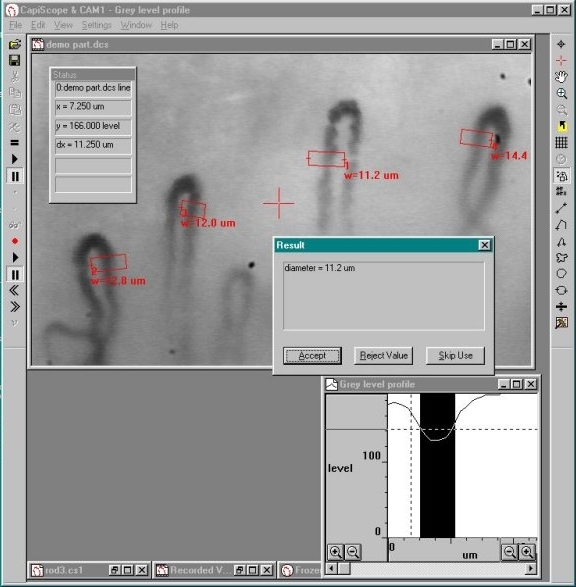 Visualize, capture and record capillaries digitally. Automatic measurement of vessel diameters. Manual and automatic capillary density. Blood cell velocities from 0.1 mm/s to 28 mm/s using internal laser. Blood cell velocity from 0 to about 2mm/s using video correlation. Fast response time follows cardiac and vasomotion velocity changes. Laser velocity measurements are NOT limited to nailfold capillaries. High quality video capillaroscopy images. Velocity can be measured from tissues with poor image quality using the laser. New small size and light weight for easier positioning. CapiScope can display and record video at full frame and full frame rate. The monochrome video is stored uncompressed to avoid problems with information loss found with many digital video recorders. Single frames can be saved in bmp or tiff formats and video can be exported as avi files. The CAM1 Capillary Anemometer measures blood cell velocity using an internal low power near infrared (780nm) laser. This is focused via the objective down to a 10 micron diameter spot in the centre of the field of view. The CAM1 laser can be positioned onto the apex of a capillary loop using the XYZ micropostioners. The laser beam is reflected by blood cells at the focal point moving perpendicular to the tissue surface. This gives the laser light a Doppler shift directly proportional to the velocity of the reflecting blood cells. The Doppler shifted laser is collected by the objective and internal optoelectronics and processed by the CapiScope Processing Unit. The Doppler shift is processed in real time to produce a velocity trace in absolute units of mm/s. The velocity trace can be saved together with an image or video sequence of the capillary being measured onto the hard disc of the CapiScope Processing Unit. Velocity can also be measured from live video, video recorded digitally on the CapiScope Processing Unit, avi files, or video from a VHS or digital video recorder*. Velocity is measured by using the mouse to draw a line along the vessel. The vessel can have any orientation, and doesn't even need to be straight. The line thickness can be adjusted so that it covers the width of the capillary. This gives an average of the pattern over the whole width. The grey level profile along the line is taken for each field every 1/60th of a second. The grey level pattern along each line is compared to the pattern from the previous field (or, optionally, several fields before for very low velocities). The comparison is performed by calculating the correlation coefficient for every possible shift of the previous grey level profile relative to the new profile. The shift which produces the highest correlation indicates the distance traveled between the two grey level profile measurements, and hence the velocity. CapiScope displays the correlation, along with the velocity trace (cbv) as a colour map, showing red for a high correlation through to blue for low correlation. The cbv (shown as a black trace) can be averaged over any period, and the table of averaged results can be saved or easily pasted into other applications. Velocity measurement range: 0.05 mm/s to 14.6 mm/s (max. Doppler shift 50 kHz). Laser wavelength: 780 nm typical. Measurement area: 8 um x 16 um approx. Image size 0.915 x 0.686 mm (640 x 480 pixels). Illumination: 8 x 525 nm light sources. Video output: USB2 8 bit mono uncompressed. 235 x 90 x 120 mm including lens and xyz. 235 x 30 x 60 including lens. Laptop: dimensions and weight depends on available models. Desktop: 300 x 140 x 365 mm. 6 kg. EN 60601-1:1990 Medical electrical equipment. CLASS II TYPE B. EN 60825-1:1994 Safety of laser products. CLASS 3A. CE Medical Devices Directive 93/42/EEC Annex VII. (class I device). Here is a quick demonstration video on using the CAM1 demo1.mp4. (size 39 Mbyte). Apologies for the poor sound quality. We'll hopefully put up a better demo soon!